A Happy Buddha lit by a rect area light. Rendered with PxrVCM. This is our standard geometric area light. Specifies the shape of the area light emitter. Note: rman__Shape is not a real shader parameter. It is tracked by RfM or RfK to be output in the RIB stream. That means that you will have to relaunch your IPR in Maya / Live Render in Katana to see the changes. Specifies the exposure of the area light as a power of 2. Increasing the exposure by 1 will double the energy emitted by the light source. A value of 0 produces an intensity of 1 at the source, -1 produces 0.5. Enables / disables textured light emission. A texture to define emitted light color. Linearize the color map. This is only necessary for 8 or 16 bits textures. HDR textures are generally already in linear color space. This resolution only affects textured rect lights. To adjust the resolution of other textured lights, see the ShadingRate control above. The Automatic option will result in using the size of the image specified in the Color Map parameter. If instead an image is specified in a network upstream from the Light Color, you should select a resolution. Scales the mapping coordinates in the S direction on the light's surface. Scales the mapping coordinates in the T direction on the light's surface. Offsets the mapping coordinates in the S direction on the light's surface. Offsets the mapping coordinates in the T direction on the light's surface. Spot cone angle in degrees. Spot penumbra angle in degrees. Change the falloff of the penumbra. Name of the emission color map. Name of an IES light profile. Rescales the angular distribution of the IES profiles. Values less than 180 specify that the profile represents less angular coverage, and will effectively increase the size of the projected profile. Defaults to -1 for full coverage / no scaling. Specifies the space that the IES profile or emission color map is in. Focusing power of the geometric area lights. Specifies the size of the highlight as a angle. Only valid when Shape is set to distant. Note: angularVisibility is not a real shader parameter. It is tracked by RfM or RfK to be output in the RIB stream. That means that you will have to relaunch your IPR in Maya / Live Render in Katana to see the changes. The angle of the top flap. The angle of the bottom flap. The angle of the left flap. The angle of the right flap. Barn doors are implemented as gobos, so they need a texture map. Ideally this would just be a black texture. 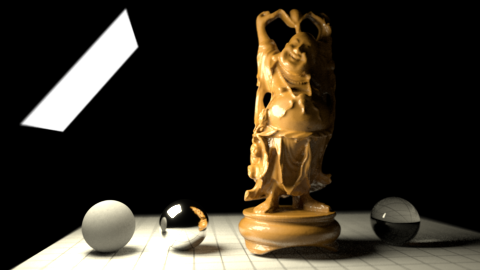 When normalize is enabled, the amount of light contributed to the scene will not change as you scale the light source. This makes it easier to adjust highlight size without changing scene lighting drastically. The group is a special type of attribute which allows you to provide light category support for geometric area lights, as well as per group AOVs for the lighting on the surface. Linearly scales the light intensity. Exposure is more intuitive for area lights. Leave at 1.